As a diehard devotee to extreme music for close to 20 years, it is increasingly rare for me to find a record that truly scares me. 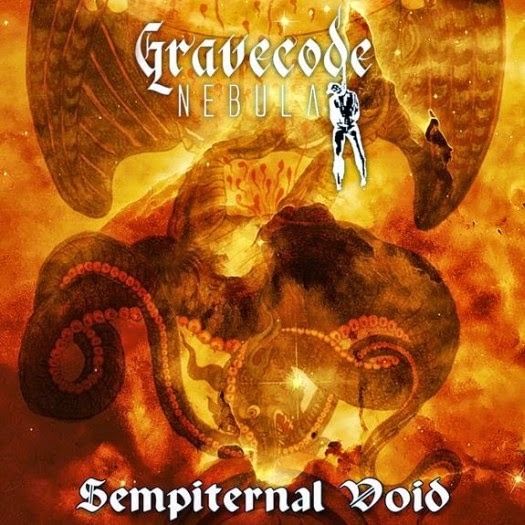 Gravecode Nebula’s Sempiternal Void, released last year, is one of the few records post 2000 that has been able to accomplish that feat. To be honest, I’m very surprised that this album somehow managed to fly under the radar and was not a prominent feature on many best of 2013 lists. Truthfully, it’s probably the lack of publicity this band has received that has helped make it have such an impact. Not since the early days of second wave black metal, when bands shunned the spotlight and simply let their music (and sometimes their actions) do the talking, have I heard an album so terrifying and so sincere at the same time. It is that very sense of the unknown that helps make this album such a prized possession in my ever-growing collection. There are a few things worth noting before I really dig into the album. First, this is not an album that sits neatly inside a single subgenre. This is one of the few modern records that manages to combine elements from several different genres, mainly black, death and doom, without diluting or destroying the essence of any of them. This isn't just a tremolo riff thrown over some death metal grunts with the occasional slow atmospheric buildup. Instead, it is a lethal combination of the best aspects of all these genres. On a random side note, the presence of Hel’s spectacular bass lines should destroy anyone’s preconceived notion that women in extreme metal is just a gimmick. At a little over an hour Sempiternal Void is not an easy listen. This is not a record you can just throw and headbang along to or drop in as background music. This album needs, nay demands your full attention. Kicking off, “Bloodcraft of Andromeda” sets the tone for the rest of the journey. The song starts off slow with a lumbering riff and simple but powerful drumming as a disembodied roar creeps in. As if this blackened doom template wasn't sufficient, at three minutes the pace picks up and we are treated to some spectacular straight up black metal riffs and blast beats, before dropping back into the atmospheric death/doom that started the song. The rest of the track continues to mutate between genres. One minute brings a minimalist slow doom riff like you might hear on a Monarch record that then transforms into some of the best death/doom around, before throwing you completely for a loop with a section swirling black metal chaos. It is a testament to the bands skill that these elements flow together so seamlessly. This constant ebb and flow makes this album so engrossing and rewarding. Each of the remaining five tracks follows this template of constantly morphing between agonizing death doom sections and blistering blackened assaults. The performance of each band member is spectacular throughout, making it hard to highlight just the guitars, bass or drums, as they all meld together so effectively to create such a devastating whole. In fact trying to point out a single riff or drum fill would actually do this record a disservice, as it is the whole rather than it’s individual parts that make this such a fantastic album. That said, it is worth taking note of the stellar vocal performance put in by The Zodiac. It is rare that you find a vocalists with such versatility. Whether it is horrifying deathly bellows, atmospheric spoken word sections or ominous chants, he somehow manages to accomplish all of them with the same level of expertise. The superb uses of effects by Dyingnysus and Lupericus Infernale are also worthy of note. While never taking prominence, their subtle touch adds a layer of darkness that would be otherwise be sorely missing. While this album is most likely to appeal to fans of death/doom, as the majority of the album sticks close to this template, there are definite rewards to be found for black metal and extreme metal fans in general. Fans of the current wave of blackened death metal being produced by bands like Abyssal, Grave Miasma and Grave Upheaval, will find much to sink their teeth into on Sempiternal Void. I would argue that while not stylistically fitting neatly into the black metal genre, Gravecode Nebula have managed to create a record that touches on that magnificent darkness that the early second wave bands made their calling card in a way that many modern black metal band fails so miserably to accomplish. So pick this one up, turn off the lights, and drift off into the sempiternal void.